On this personalised experience, see another side to Tokyo when the city comes alive after dark. 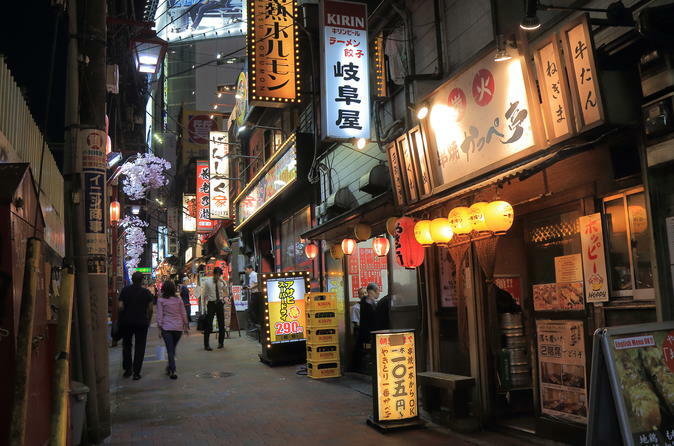 Experience the city’s nocturnal alter ego as you head out with a Local Host to the traditional drinking houses known as izakaya as well as the tachinomiya, yokocho and karaoke bars! Get ready for an unforgettable night in Tokyo, experiencing the local customs and exciting nightlife with a Local Host! Why not start the night bar-crawling through Golden Gai, an area in Shinjuku lined with narrow alleyways and packed with tiny, slightly ramshackle but buzzing bars. From here, you could hop to an izakaya and then to a tachinomiya. These standing street front bars are synonymous with Japan’s nightlife and, here your Local Host can introduce you to yakitori (grilled chicken skewers), a classic accompaniment to a night out in Tokyo! Once you’ve bar-hopped your way through this area, perhaps head to another yokocho, the historic alleyways that are steeped in tradition and dotted all over the city, where you’ll find more character than you thought could ever be squeezed in to such narrow streets! Next, you might want to join in the local 3am karaoke custom or go shopping instead. This experience is custom to your needs, wants and wishes, and so the choice is yours! End your night (or begin your morning!) like the locals do with a steaming bowl of ramen at 5am, or try another local staple at one of the many eateries which are open 24 hours a day. Throughout the experience, you'll get to know your Local Host, who can give you insider tips and ideas for how to experience the best of Tokyo by night, and recommend other yokocho, bars and eateries to visit during the rest of your stay in the city. Enjoy an unforgettable night out in Tokyo with a Local Host! End the night like the locals do queueing for ramen at 5am!